View in Fish Creek Canyon looking towards northwest and down stream in direction of the Salt River from just below Apache Trail crossing. May 2009. 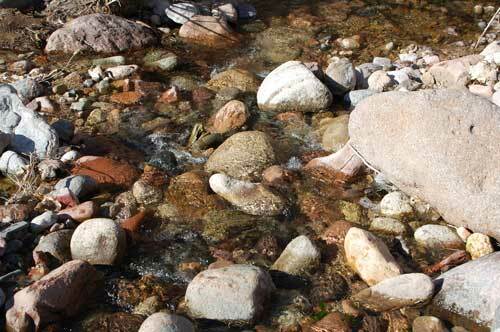 Through much of the year deep pools of water remain in the shady chasms carved by Fish Creek. Numerous aquatic animals - fish, amphibians, and especially insects can be seen. Oct. 2005. Among the many spectacular scenic roads in the Sonoran Desert, the Apache Trail ranks high. Driving it is not for the faint of heart or the reckless as the route is narrow and the drop-offs near and preciptous. Otherwise known as SR-88, this historic route skirts the northern edge of the Superstition Mountains where the Salt River has cut deeply through the soft volcanic tuff and rhyolite. Man-made dams along the Salt have impounded several reservoirs which attract millions of boaters, swimmers, sportsmen and campers. At times the most dangerous aspect of the roads are the drivers whose first concern is not always safety. That said, if taken with caution and care, this will be one of your most memorable drives anywhere! View Larger MapThe blue-wave icon indicates the point where Fish Creek crosses the Apache Trail. Parking is limited at bridge, but more areas to park are available about ½ km east. 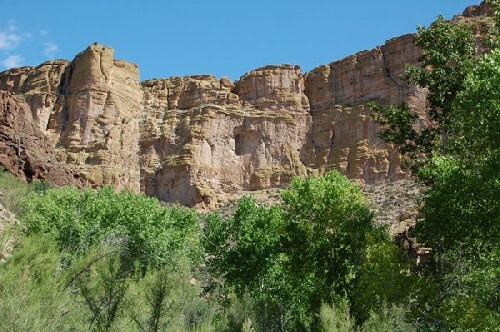 The Goldfield Mountains, noted by the trekker symbol at left, are northwest of Apache Juncion. Tortilla Flat has an eatery and is a good endpoint for a Sunday drive. Six members of Arizona Natural History Field Trips, a Yahoo Group, carpooled to Fish Creek arriving at 8:30 am on Super Bowl Sunday. The temperature was not far above freezing because chilly air tends to flow down through the deep, narrow chasm carved by Fish Creek through the Superstition Wilderness to the south and east. It was 10am before sunshine began reaching the canyon bottom where we were hiking. The term ‘hiking’ is used loosely because we stopped every 30 meters or so to look at some new form of biota. The most curious observation on the day was made by Laurie. Because we were also looking for birds she looked up and happened to notice a huge aggregation of red and black bugs some 10 to 15 meters up in a cottonwood tree. The cluster must have contained well over a hundred individuals of probably Bordered Plant Bug, genus Largus. From the ground, using binoculars, the cluster appeared to be shimmering black and red, seemingly a clear aposopmatic signal that these bugs are bad to eat. Were they over wintering in this fashion or massing for feeding on the cottonwoods, some of which already had flowering buds opening? 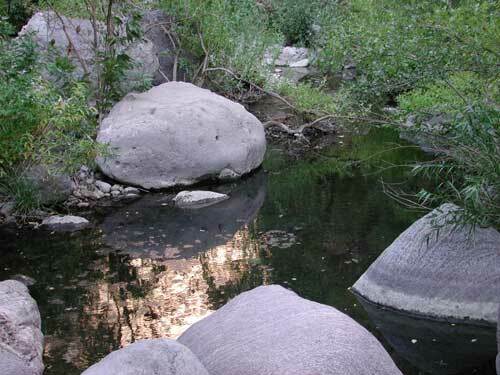 Water flows through Fish Creek on a permanent basis and indeed there are fish that live in the pools. Most of these are exotic invasive fish species such as the Green Sunfish (Lepomis cyanellus). 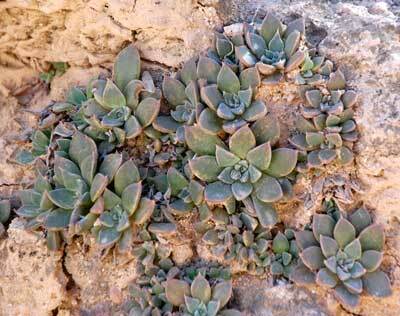 The nearly verticle walls of porous tuff offer an excellent substrate for Rock Echeveria (Dudleya saxosa). Note the large number of nascent seedlings in the photo at left. The rocks are fissured repeatedly and there are many small ledges and wind caves each of which support many plants seemingly in defiance of gravity and without obvious water. A partial list prevalent species seen at Fish Creek. Big root is a fast growing wild cucumber vine of early spring that grows up through mesquites and other trees on the wash bank. A huge underground root survives year-to-year. 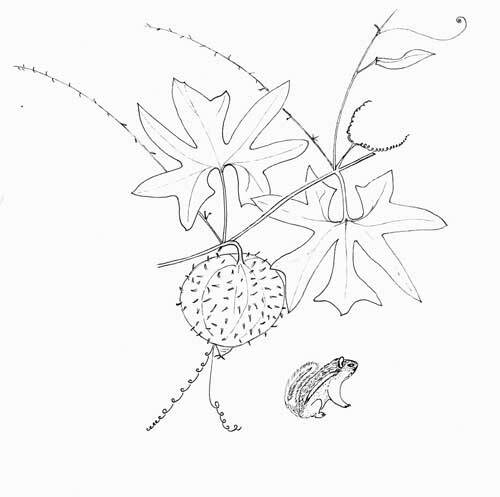 The cucumbers, inedible to humans, are spherical and prickly with large seeds eaten by squirrels.